Not everyone who appreciates fine wine has a towering collection of dozens of bottles. That’s why a 12-bottle cooler is the ideal size for the average wine drinker. 12-bottle wine coolers are more compact and can more easily be moved around when redecorating or rearranging your kitchen or wherever you may decide to keep your cooler. With smaller coolers like ones with 12-bottle capacity, thermoelectric cooling systems are the most common. They’re simple, quiet, and don’t give off harmful vibrations. All of the products in this list use thermoelectric cooling systems. Thermoelectric is the best! One slight disadvantage of thermoelectric coolers that you need to accept before choosing a smaller sized, thermoelectric cooler is that they are generally dependent on ambient temperatures. It’s not recommended to keep your cooler on your porch during the winter, or any other time for that matter. Thermoelectric coolers usually don’t have the ability to heat or raise temperatures, only cool. So that’s one thing to keep in mind when choosing your cooler—where are you going to put it? If it will always be kept in a room where the temperatures are well-regulated, ambience will not likely be an issue. 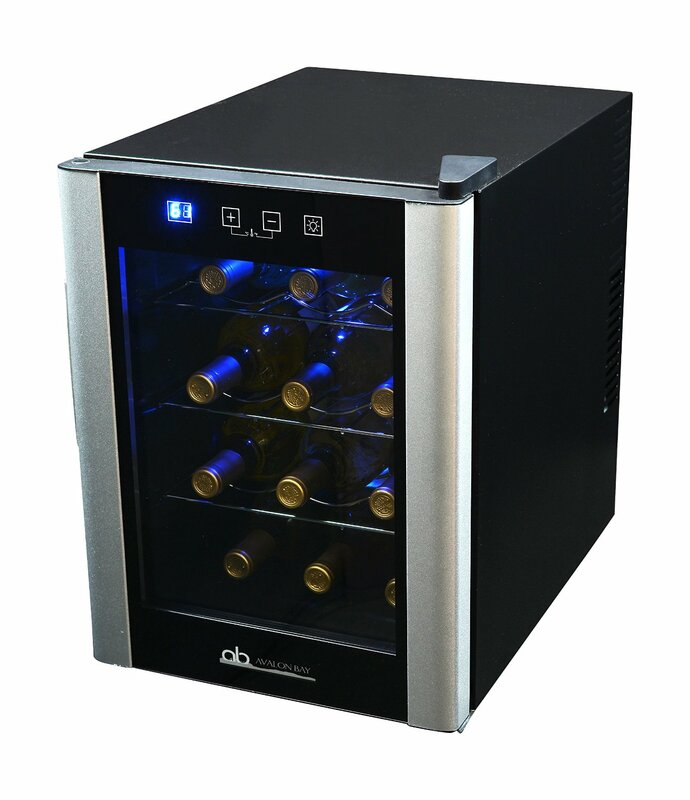 You can get a fantastic wine cooler for a pretty low price. We’ve already done the shopping around for you and selected a few options that offer an excellent value for the money. We’ve done all the digging, review reading, specification comparing and testing so you don’t have to. If you choose one of our top picks, you can’t go wrong! Here are our top four choices for best budget wine cooler. This thermoelectric wine cooler fits 12 standards bottles easily, and features a digital temperature display on the front so you can always keep track of how accurately it’s holding its temperature. It has the usual blue LED interior lighting that we see with most wine coolers. It’s freestanding and can be placed on the floor, on a stand, or even on top of your kitchen counter as it weighs only 24 pounds. It’s compact and can easily fit into tight spaces. 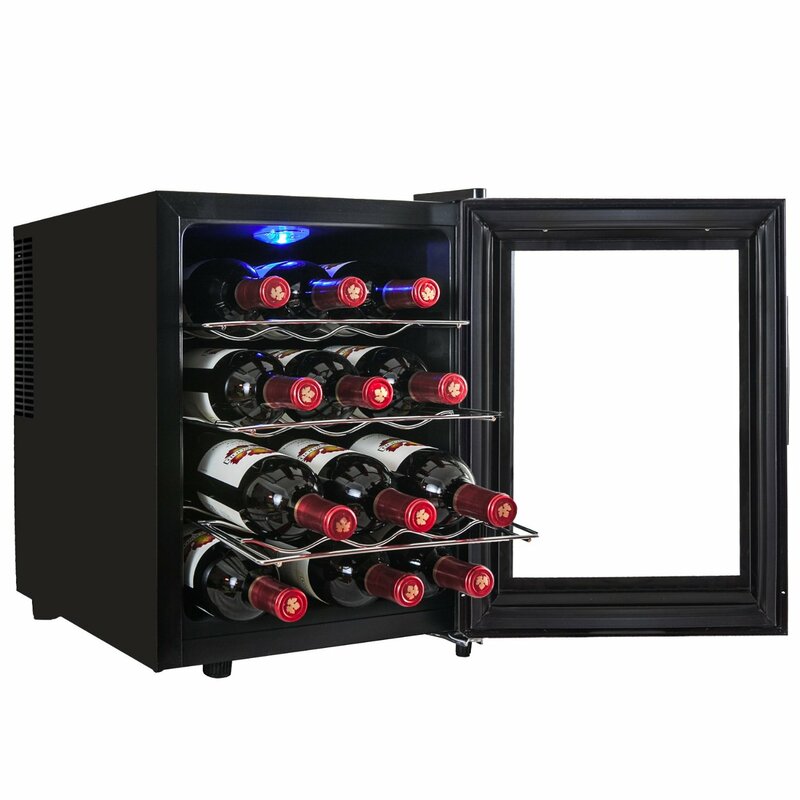 The 12 Bottle Single Zone Wine Cooler has 3 removable chrome shelves. If you need to make space for larger bottles, you can simply remove one of the wire racks. This cooler’s black steel design fits well in any room. It will stand out in a good way in your home, and spark the curiosity of your guests. It won’t be an out of place eyesore in the room, since its basic design is so neutral. That means you can put it pretty much anywhere and just plug it in. As reviews have noted, this model in particular tends to maintain temperatures very well, even in hot rooms with no AC. It’s no wonder virtually all reviews for this product on Amazon are positive. It does exactly what it should do with no outstanding problems. For around $130, it is an awesome value buy too. Temperature ranges are not 100% accurate. The cooler tends to reach 53°F rather than 51° as advertised. 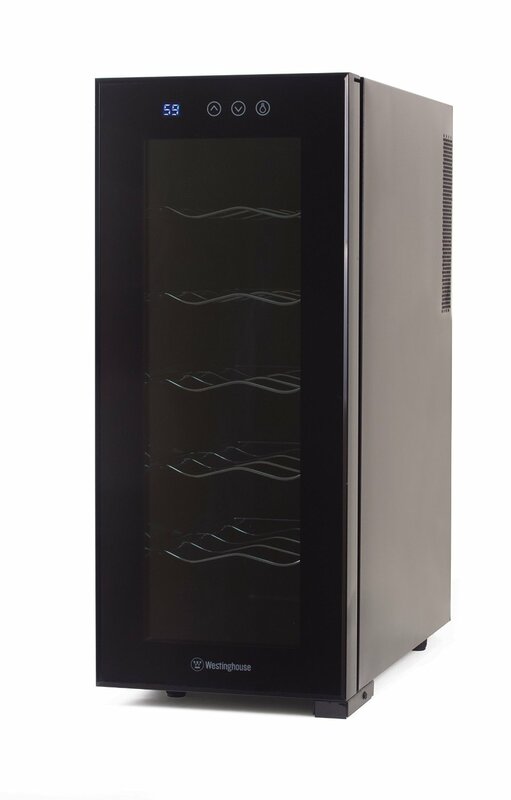 This AKDY 12-bottle wine cooler uses thermoelectric cooling. It runs very quiet. Its fan spinning can barely be noticed. It has an electric touchpad on the front for easy temperature control. It includes an interior LED light that allows the labels of your wine bottles to be seen more easily, even at night. It also works as a pretty good nightlight. The AKDY 12-bottle cooler is energy efficient. It vents from the back and has three removable wire shelves that allow your bottles to lay horizontally. Storing your bottles in a horizontal position is better than storing them in a vertical position because it is important to keep the cork moist. If the cork dries out, the airtight seal could be broken, thus spoiling your wine. Keeping wine bottles on their side also allows sediments to be distributed more evenly, rather than all compacted at the bottom. The temperature inside the AKDY 12-bottle cooler ranges from 50°F – 66°F (10°C – 18.9°C). The fact that this wine cooler goes as low as 50° is great if you prefer your white wine to be very cold. It costs around $150 and comes with a one-year manufacturer warranty. The Sunpentown WC-1271’s slim design allows it to squeeze neatly in between two other appliances. It’s freestanding and includes legs on the bottom. The temperature is controlled by a touchpad. The inside is illuminated by a blue LED light. Its five chrome racks slide all the way out so you can always fit larger bottles like champagne bottles without a problem. With all the racks in though, it is a tight squeeze to fit 12 standard sized bottles. Its thermoelectric cooling system provides temperatures that range from 52°F – 65°F (11.1°C – 18.3°C). Its got a black metal design with platinum trim and a recessed handle. It’s quite sleek, especially due to its shape. 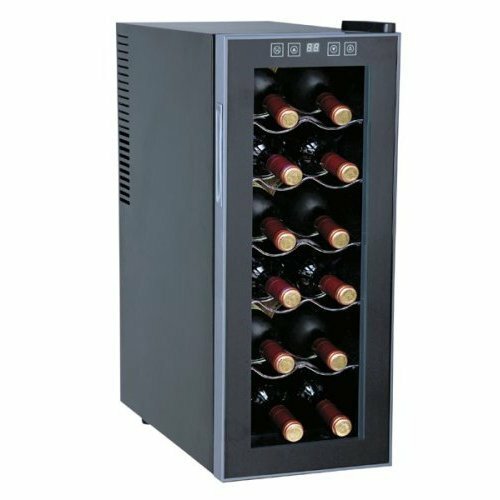 It stands out from other wine coolers because of its slim design. Your guests will definitely inquire about it. Their curiocity may lead to sharing a glass of wine and thus bonding on a more personal level. Be sure to leave five inches of clearance around all sides of the unit for ventilation, otherwise the cooler’s heat distribution process could be interfered with, resulting in less than optimal performance that may disturb your wines. The Sunpentown WC-1271 costs about $140 and comes with a one-year limited warranty. This cooler by Westinghouse includes a touch panel with a digital display, and an LED light on the inside. Its temperatures range from 54°F – 66°F (12.3°C – 18.9°C). It runs at a very low volume, just 38 dBA. Compared to other coolers, it’s very quiet. It features five chrome wire racks that pull right out if you want to make some adjustments to accommodate larger sized bottles. It has a recessed door handle with hidden hinges. The design is sleek. It’s meant for home use and can fit in small spaces as it’s well-sized. For about $140, this awesome compact wine cooler can be yours.